Colours have fantastic names: Bubblegum pink, Gooseberry, Sunflower Symphony, Fuzzy peach, Harvest Oats, Smiling Yellow, Hot Terracotta, Midnight Iris, Clouded Pearl, Tiger Orange etc. However, as much as I love this aspect of colour, I am not very good at it. 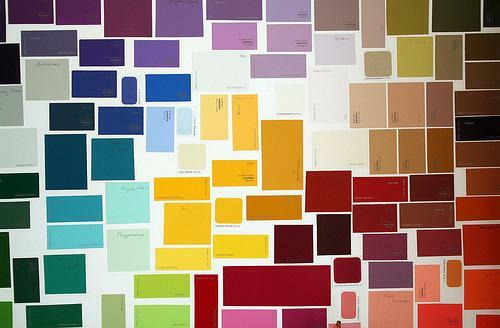 So, to help me I have collected paint swatches that I can match a fabric to and name it. To organise these swatches I made a colour board. My house is over 100 years old and my front room (which doubles up as my working studio during the day) has a hole in the wall. This used to be a window before the flatlet, which is where I live, was built. 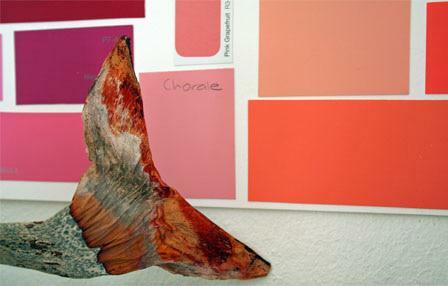 I have used this ‘hole’ to create my ‘colour’ still life of paint swatches and dyes – like a window of colour. This entry was posted in Blog and tagged Colour, Colour art, Colour names, Colour Wheel, Natural colour, Natural Dyes, Still-life. 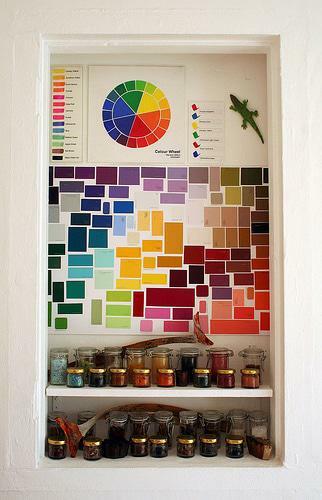 Wow… your wall and colourful board looks fantastic! You are so creative!Really nice!Maybe next year Anne can see all your wonderful things in the real life!